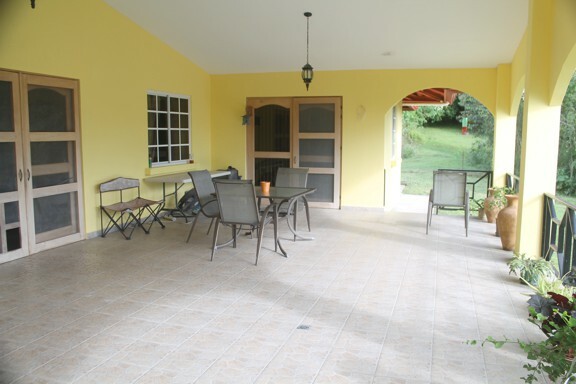 Cayton Estate offers Panama's finest location. 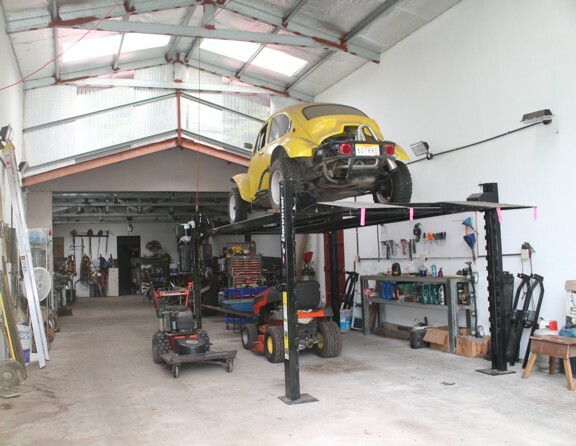 Acreage, country garden setting and fully equipped workshop. 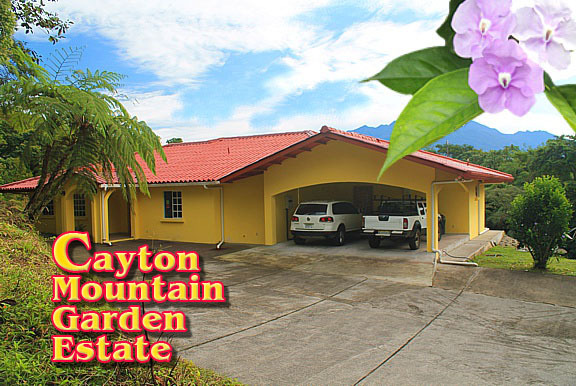 Cayton Mountain Garden Estate, is in the highlands of Chiriqui, Panama. 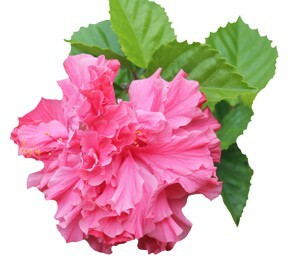 Famous worldwide for its "Eternal Spring" climate. Imagine your perfect fresh spring day where you live now. 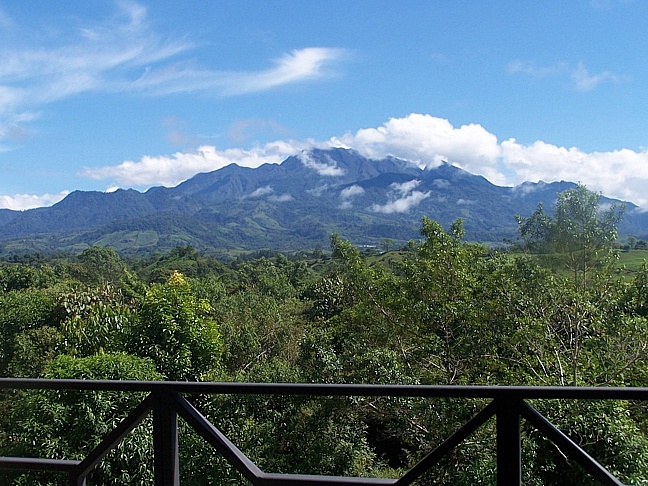 That just about sums up the highlands of Chiriqui, Panama - never too hot or too cool. 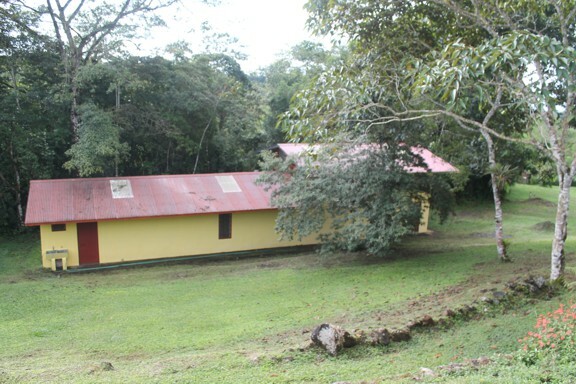 This is a view of the main house looking West. Now look below to the view looking East. The towering magnificence of Panama's highest peak. 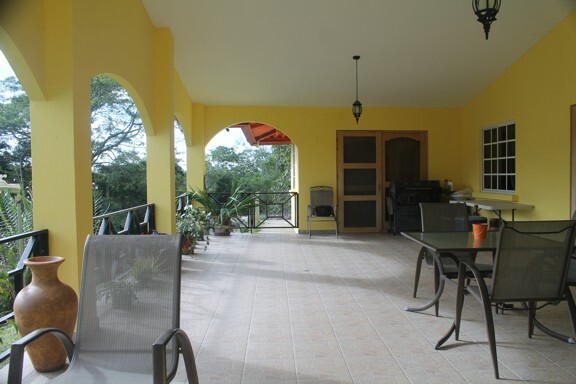 This is a view from the balcony of the main house. 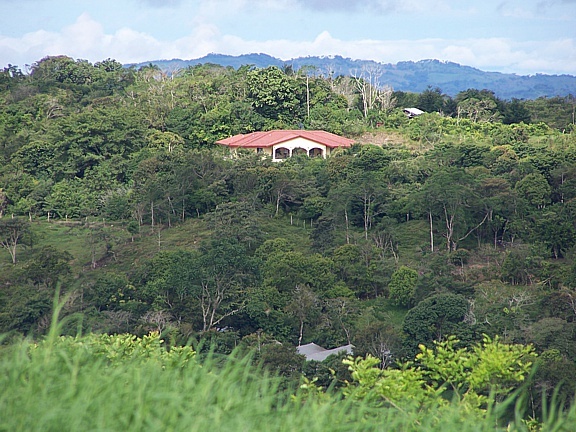 The Cayton Mountain Garden Estate is located approximately 1 km north and 1.25 km west of Cuesta de Piedra on the Escarra Road to Lecheria Sucre. 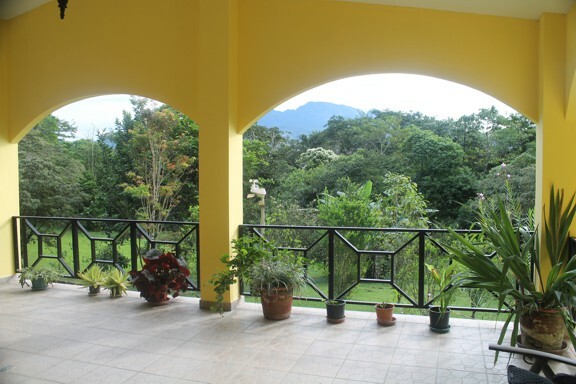 From the main, East facing patio, you can see Panama’s tallest mountain; the 11,400 foot Baru Volcano. Looking South from the main driveway it is possible to see the distant outline of the Pacific Ocean. As you climb the driveway you'll come to the main house. 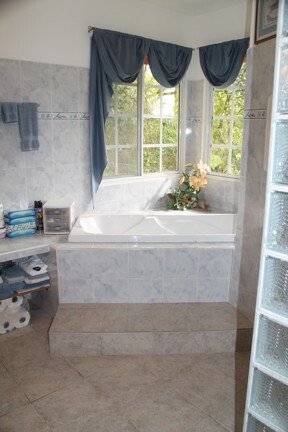 The total area is 3,822.19 square feet (355.09 sq. meters). The open area is 1,154 sq. ft. (107.24 sq. meters). 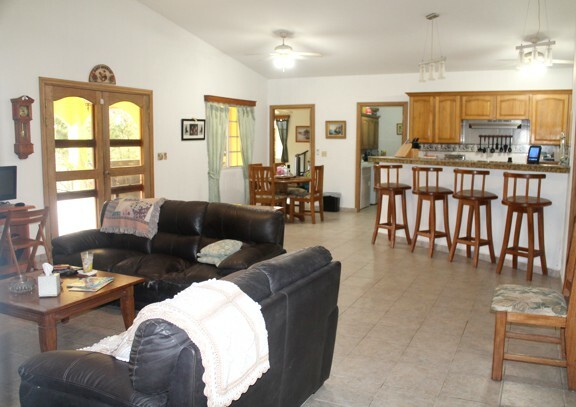 This includes the carport, the entryway, and the covered patio area of 622.4 sq. feet (57.8 sq. meters). It is tiled and has an ironwork railing around three sides with a gate on each end. 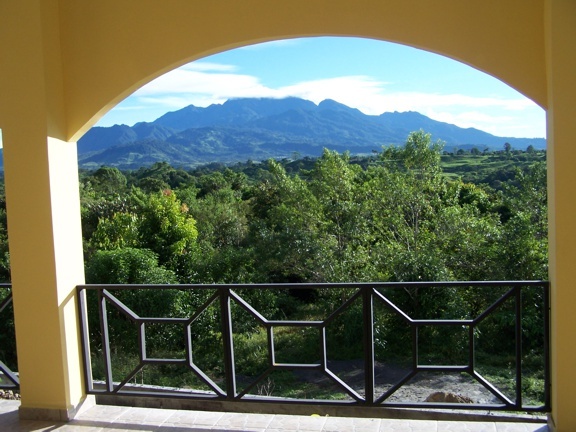 Beautiful views of Volcan Baru can be seen from the patio. There is also a small sink in one comer. The house is equipped with a 14 KV LP generator.with automatic start and stop switch, so when the power goes out it starts in about 10 seconds. 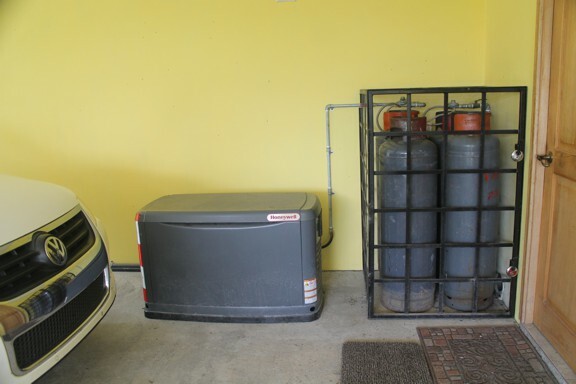 This is located in the carport area, as is a 33" X 36" locked enclosure for the four 100-lb. bottles of gas. All regulators have flip switches to be used to switch tanks when one of them is empty. The water system is locally owned and is governed by the local residents and NOT part of !DANN. On the hill above the house there are two (2) 450 gallon water tanks. This water is double-filtered and is very good water. The expansion tank and the water pressure pump is new and works very well. 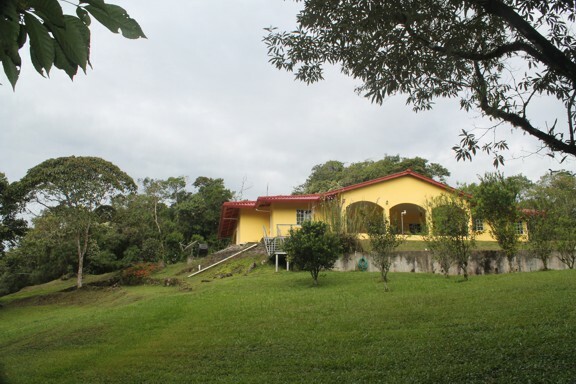 This property is 14,816 square meters, which is a little over 3. 7 acres. The property was built in 2006, is titled and has a remaining 8 years of tax exempt status. There is a paved driveway with an electric remote-operated gate. 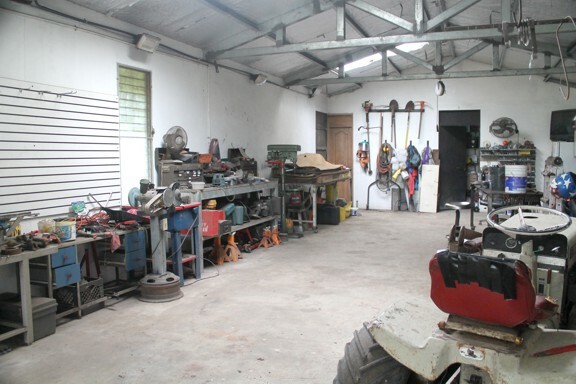 Two separate buildings, the main house and the fully equipped workshop, make up the estate buildings. At the front door there is a covered entry. Through the door is an entry area leading into the vaulted great room. To the right is the kitchen area with a 10 foot X 18 inch bar which serves as a divider between the kitchen and the living room. In the kitchen is a built-in double porcelain sink as part of the 10 feet of counters. (All counters in the kitchen and bathrooms are granite.) There is a 2' X 4' center island with a door on each side and roll-out shelves behind. The back wall has 8.5 feet of counters with the refrigerator (including ice maker) to the right (across from the freezer) and a cutout where the full-size stove gas stove is installed. A vented hood is above the stove, and there are 13 feet of overhead cabinets. 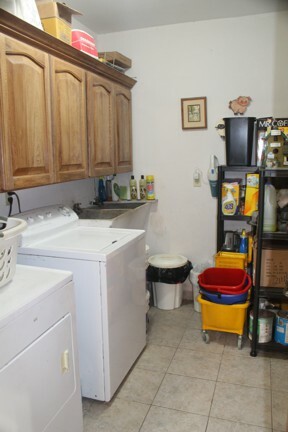 To the right of the refrigerator is a walk-in pantry ( 4.5' X 9') with full shelving on three sides. The vaulted living area includes a 10-foot built-in entertainment center with massive drawer storage, glass and wood shelving and glass display doors. Accent wall is painted sage green. 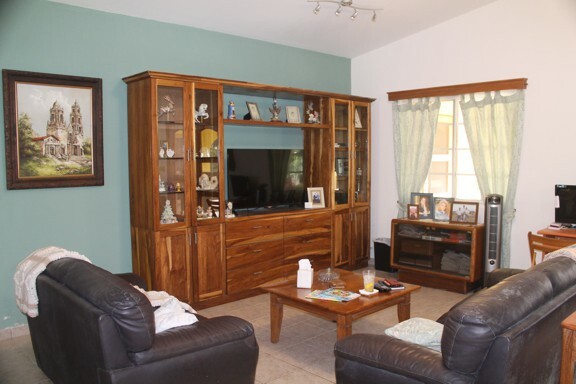 There are accent lights above the center, and in the living room is an overhead fan with lights ( as there are in each room of the house except for the bathrooms, which have exhaust fans and separate lights). There is a large square coffee table and two very well-used leather couches. Inside the house there are two (2) large master suites. 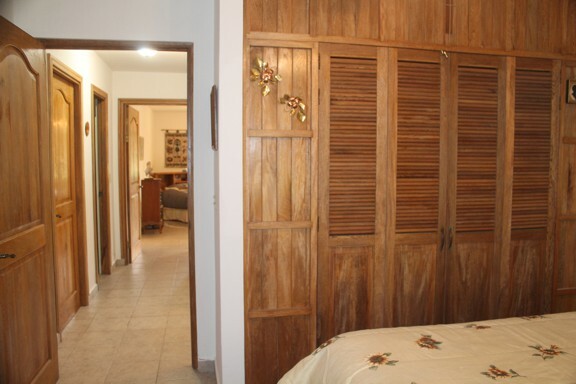 Each includes a walk-in closet and a full bath. 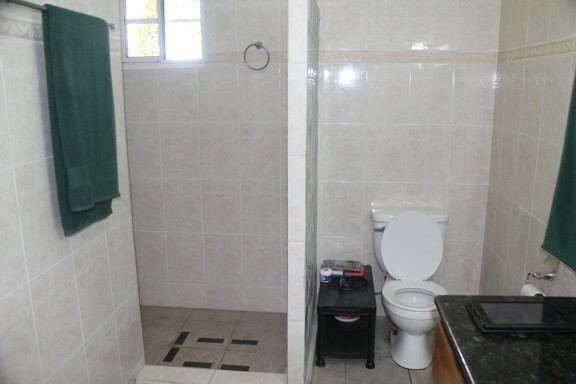 One of the suites has a garden tub, double sinks and a walk-in shower. 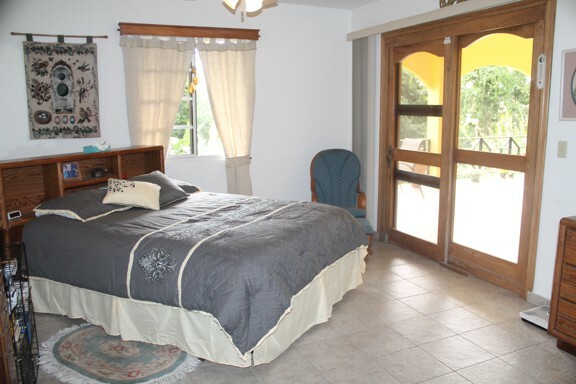 Both of the master suites open onto the patio with sliding doors. Walking out of.the kitchen to the right is a utility room and a door leading to the carport. Straight ahead from the kitchen is the dining area with a 48-inch round oak table and 6 chairs. Off the living room is a den with a built-in desk, an area for computer, 24 feet of counter space and book shelves a bunch. It also has 12 under-counter drawers for more storage. 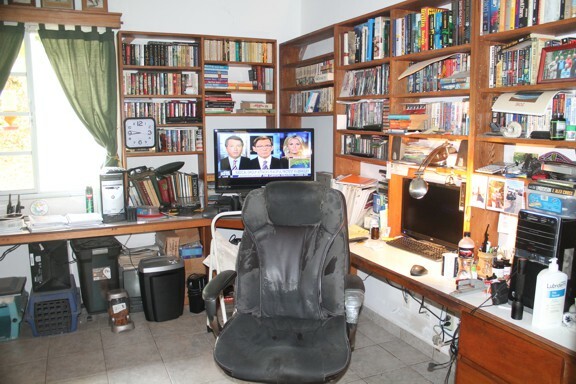 There is an additional computer/hobby room with built ins: 14.5.feet of counter space with six drawers and under-counter shelves, plus a storage closet with many shelves. This room is hard-wired from the modem for the computer. After coming through the gate, the shop is located to the right of the driveway. The area of the shop is 1560 sq. feet (145 sq. meters). It has a 5 HP air compressor which is plumbed throughout the shop area. 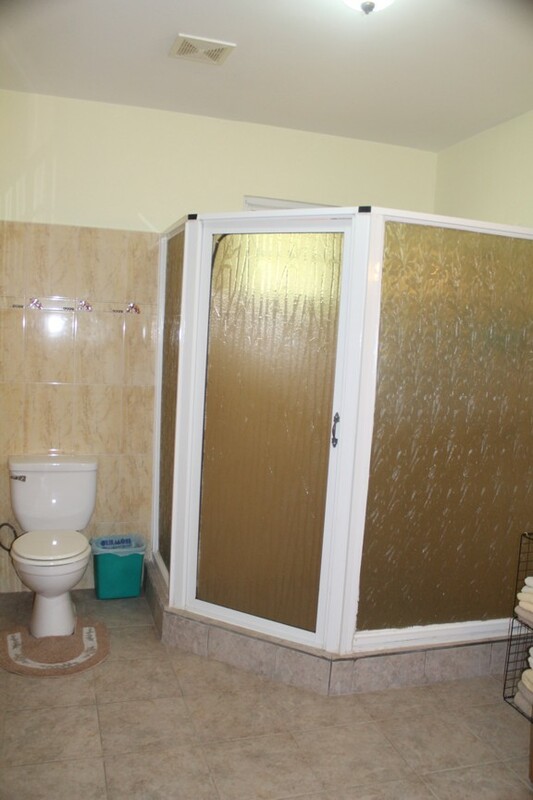 There is a bathroom at the rear including a shower and hot water heater. 600 sq. feet of the shop has 14 foot tall sidewalls to accommodate the 7,000 pound drive-on vehicle lift. The shop areas have translucent roof panels to let in the natural light and are also equipped with lights for work at night. A 20- foot container is located beside the shop for additional secure storage. Behind the container and adjacent to it is a 10 foot X 26 foot storage area with a cement floor that is also secure. This area is also plumbed with air and equipped with a sand blaster, electricity and is used for storage of large equipment. Outside the main shop is a double utility sink. 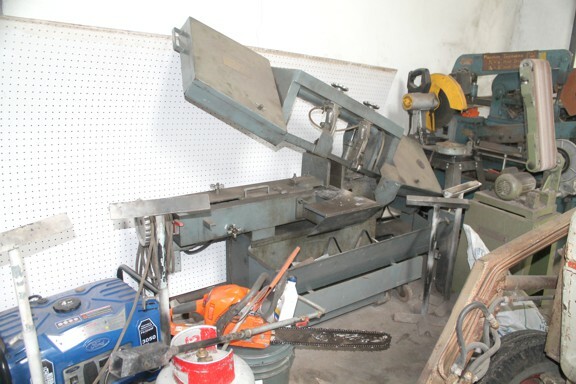 This could be a perfect place for a hobbyist to restore classic cars? 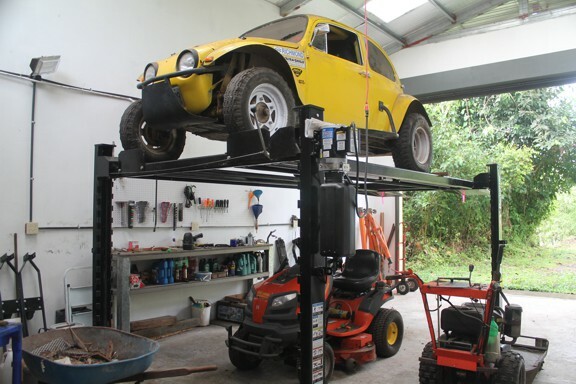 It would be true to say that this workshop is better equipped than most garages in Panama. If you require more pictures of the equipment please contact the owner. 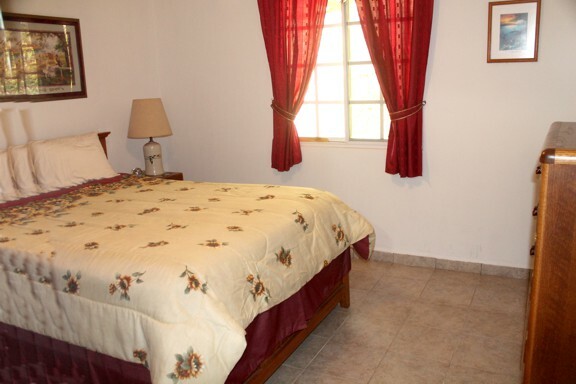 There is a third bedroom used as a guest room and a third full bathroom for guests. 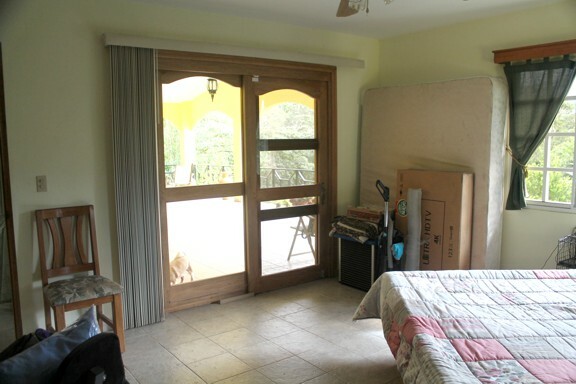 The house is equipped with a video surveillance system and has alarms on all the doors and windows. The property is in a corporation: Carrousel Adventures Inc. 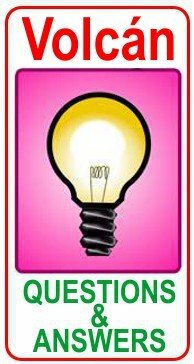 The corporation is owned by: Jay W. Cayton & Beverly C. Cayton. This property is 14,816 square meters, which is a little over 3. 7 acres. The property was built in 2006, is titled and has a remaining 8 years of tax exempt status. Please contact the owners (Jay or Beverly Cayton) for more information. Above is the sales value of this home and estate . . . but as the well known television advertisment might say: the view from this home is well . . . priceless!